Each one of us is meant to shine in his or her own way, if you have not uncovered it yet…don’t worry it will come soon and with a great deal of quietness around. There is no reason for egos to be greedy or to compete because as masterpieces, we are unique and equipped with all that we need to accomplish all desires. Everything was given..everything is. We have to become aware of its existence. “Within you and within me, there is also a law in operation -a law of life- and our awareness of the presence of this law is our supply” the universal consciousness. Joel J. Goldsmith. To get here are many questions to ask but now lets mention prayer. Gregg Braden experience with the Indians showed him what Nikola Tesla was grateful for many years before: Visualization that came after and from his own involvement, his hands on an issue. After a few minutes of waiting for the Indian to pray Braden asked if he was going to pray and he answered that he was doing it, that he was feeling the mud on his feet, his clothes wet, drops on his face and the cold of cool fresh water on his face. And in fact…rain came as he expected. The other than living aspects we learn by interaction and communication or the media, such as suggested and created needs or even created sickness, mislead us from that glorious lovely path I call heaven. Is it that we worry too much about the things of the earth…and dedicate no time to our nature as spiritual beings? Or is it that with all those learned false beliefs or traditions (what can a child learn from an everyday display of say…headaches, and it is not inherited…is learned), we are living a life per default, like robots?. Or like doggys that are given a treat after sitting, or just change mood when someone praises us and get blue when were not invited to the party. Do you live to eat…or eat to live? Do we use food as a way of hiding or escape or face our feelings? Imagine you were born in a rich family, never worry about what to wear nor what to eat. Your father was always pleased to provide, no question. Easy for you if you have the image of God as this kind of a Father, you know that he knows what you need and provides. Otherwise…nothing is a given and life is kind of a struggle, exactly as the image in your head. Let’s not take for granted that intelligence, wisdom, and harmony manifested in us even when sleeping or breathing; you might realize that something greater rules in your life. If it does such an extraordinary work in the body…how greater can it be in life? But…there is a big but! we have to believe to see it not the other way, work on that and act as it is done. The happiness of having it nor the sadness of the lack of it. It is already there and we can get it. Better not to wait for someone else to do it for you. In Joel Goldsmith’s words, we must live as the “Law of Life unto our affairs”, as the Principle of our being. And I will remind you that we have dominion over everything. As if that extraordinary mechanism that works in us works also for us. The supply is always there in a tree, for example, even though at a specific moment it has no fruit. Quantum Physics has proved that we live on a wave of probabilities…so I understand now…I am the one who puts it in motion. It is imperative to live a second at a time bringing up harmony and peace in oneself first. Spare a chance remembering that which everyone already unconsciously knows. 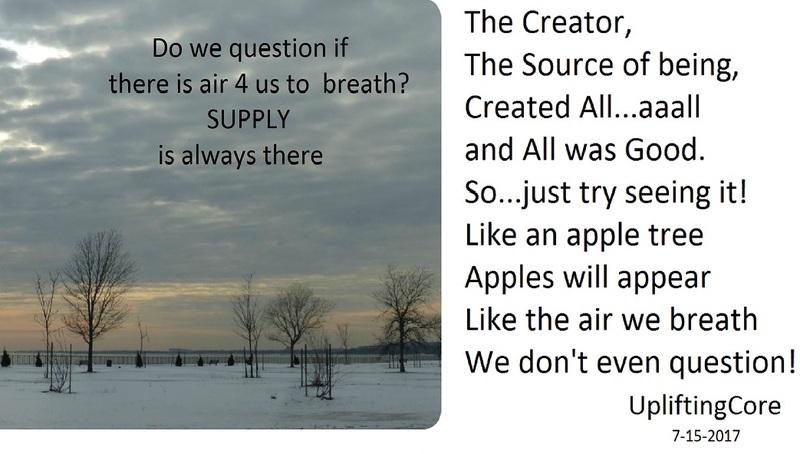 That we were given all when creation…and all was good. All Is Well and we must act as the kingdom within is ruling in our existence acknowledging God’s presence within in communion, stillness, and meditation. The time is coming when we get back to live our own life instead of living other’s lives when we remember that we came to experience and enjoy life like some children do. When we set priorities in order, thinking first in the human being as a whole and not in getting more and “better” no needed things.